THE WORSHIPPER AND THE DESTROYER OF VENERABLE ANTIQUITY. 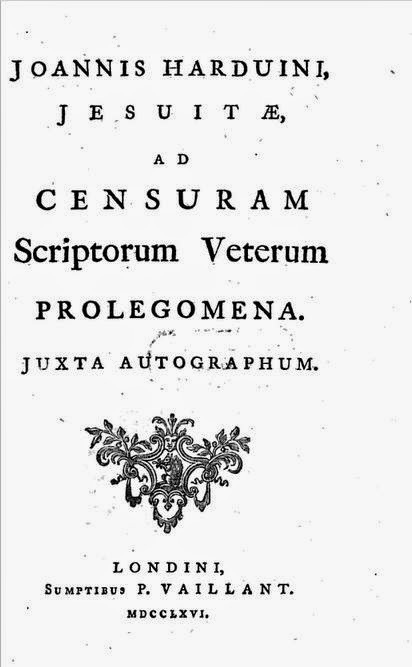 In 1766 there appeared in London a seemingly dull book in Latin by a long-dead French Jesuit, Father Jean Hardouin, entitled Ad Censurum Scriptorum Veterum Prolegomena [An Introduction to the censure of the Ancient writers]. The publication passed scarcely noticed, yet it was a startling work, for in an age of eccentric scholars, Father Hardouin must surely rank as the most eccentric of all. Rumours of his famous “system” had circulated from early in the century but only now was the full extent of his folly revealed. Almost as surprising as his conclusions, was the high regard Hardouin had been held in by the scholarly community. Although prevented from publishing, he had been harboured and protected for years in the Jesuit house in Paris, where he continued esteemed by many for both his piety and learning. Suggests too that there might be more to "Hardouinisme" than mere craziness. 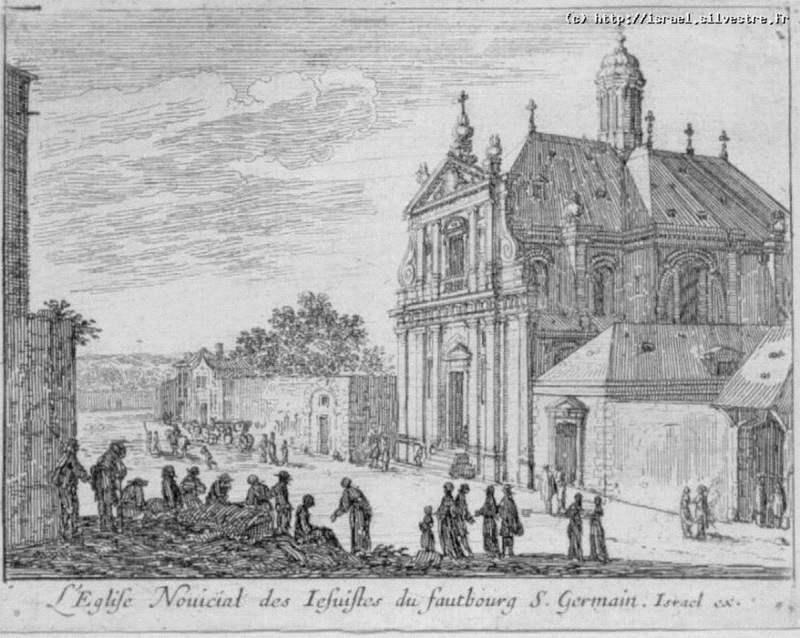 Born in in 1646, the son of a printer-bookseller from Quimper in Brittany, Hardouin had entered the Jesuit novitiate in 1660, become a professed Jesuit in 1770, and rapidly established himself as one of the leading scholars of his age. His interest in textual criticism and numismatics made him one of the few Jesuit scholars who could rival the enormous prestige of the Benedictines of St Maur. In 1684 he was charged with the edition of Pliny “ad usum Delphini” and in 1985 with the highly prestigious commission of an edition of the Councils of the Church, for which he received a royal pension. 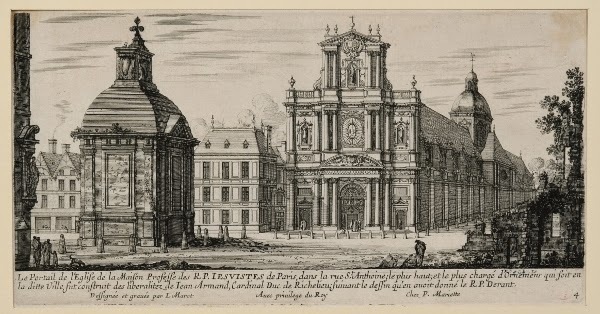 From 1685 onwards he was also Professor of Scripture at the Collège Louis-le-Grand, though in 1691 he was judiciously removed from his teaching post and made librarian at the Professed Jesuits’ house in the rue Saint-Antoine. The Jesuit Church of St Louis, rue Saint-Antoine. Although his work already betrayed a certain eccentricity, it was from1690 onwards that Hardouin began to elaborate his "system". As the Prolegomena makes clear, his initial suspicions fell on the Church Fathers, chief among them, St. Augustine of Hippo, the great authority of the Jansenists. For a Jesuit to question Augustine in the early 18th century, was roughly equivalent to presenting his colleagues with an unexploded bomb. At first Hardouin was pretty effectively muzzled by his superiors, but vague hints of forgery began to appear in two works of chronology published in 1693 and 1697. Rumour circulated that Hardouin intended to point the finger of accusation at 10th-century Benedictines. 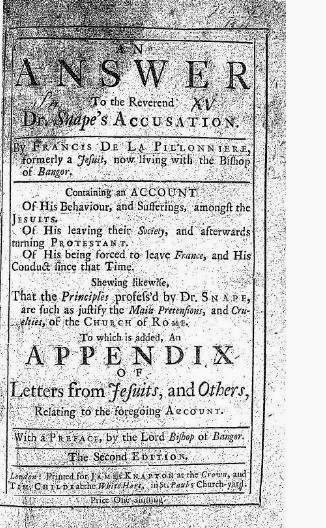 In 1707 the former Benedictine La Croze accused him of seeking to undermine Catholic tradition and he was forced to formally retract. That he had not reformed was made clear when the offending works reappeared as part of a volume of Opera Selecta published in Holland in 1709. In 1715 Hardouin's massive history of the Church Councils finally appeared, only to be condemned as too favourable to papal authority and prevented from going on sale for another ten years. Although the work was finished according to orthodox scholarship, four volumes of manuscript notes revealed Hardouin's belief that all Councils prior to Trent were fraudulent. When asked how he could have nonetheless laboured on his edition, he replied that "Only God and I know that". Little more was heard of Father Hardouin until after his death, when his friend the abbé d'Olivet took possession of many of his manuscripts, no doubt for fear they would be destroyed. The Opera Varia, published by d'Olivet in 1733, reproduced a few completed works, including the "Athei detecti" a mystifying attack on a seemingly disparate list of philosophers and Jansenist theologians, including Pascal, Descartes, and the Oratorians Louis Thomassin and Nicolas Malebranche. The dissertations on secular sources yielded two idiocyncratic allegorical interpretations of Horace and Virgil, which caused Voltaire suitable amusement: "He believes that Aeneus is Jesus Christ and Lalage, Horace's mistress, is the Christian religion". No doubt it was d'Olivet, who waited over two more decades, until he himself was in his eighties, before daring to publish the Prolegomena. In all this this time the outside world still had no real key to the system. 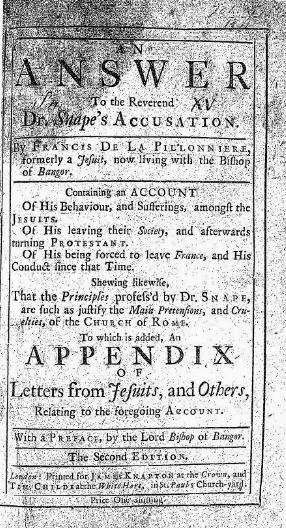 However, some clarification was provided in 1717 when an erstwhile young disciple, François La Pillonniere converted to Protestantism, fled to London and published his experiences. Various versions of his account exist, including one in English, which is amusing for its portrait of Hardouin, but also informative about the idea of "atheism" which underpinned the system. ...I was struck with nothing more than with what he insinuates concerning a Set of Atheists, leagued in order to root out true Religion from amongst Men. This Faction, made up of Ancient and Modern Authors, whom He charged with a very Impious and Atheistical System indeed; but which had Being no where else than in F. Hardouin's crazy Brain; and on which nevertheless he had built his own Imaginations, about the Works of the Fathers, and almost all the profane Authors not being Genuine. I desired Father Tournemine to tell Me what was that Atheistical and Chimerical System of which He spake. F. Tournemine answered that F.H. charged the Authors of those Books with having no other GOD but TRUTH (which was not a SUBSTANCE) and with designing to draw the World into their Atheism, by their damnable Way of Reasning upon that Subject. F. Tournemine let slip a Word, in the Course of our Conversation, viz. That the two Ancient Books, F. Hardouin had most Spite against, were St. John Damascen and St. Augustin's Second Book about Free-Will. La Pillonniere repaired to the Library to consult these works where, "being strongly prepossess'd with some of the dark Notions of the Schools", he came to the conclusion that F. Hardouin was "not so full of Dreams as it was commonly thought". "Whilst I was revolving these Thoughts, with St.Augustin's Book laid open before Me, F. Hardouin, who was the Library-Keeper, comes in . Finding me in a very good way, He led Me into his Secrets for the first Time. He instructed Me for many Hours together, both about the Atheistical Principle, and Heretical Consequences, of the system of the ROGUES. Les FRIPONS (which was the Name he constantly gave to Thos whom his Adversaries call'd the FATHERS OF THE CHURCH)....He told Me a thousand Things very entertaining, and very worthy to be offered to the Curiosity of the Publick.. The serious point of course is that Hardouin's reservations about rationalist theologies - among them the neo-Platonism of Augustine - was not so very far from those of other Jesuit scholars. He belonged to a close knit lose knit group of associates which including not only Tournemine and d'Olivet, but also Pierre-Daniel Huet, the former Bishop of Avranches and notorious proponent of scepticism, who had retired to the Jesuit house in the rue Saint-Antoine. 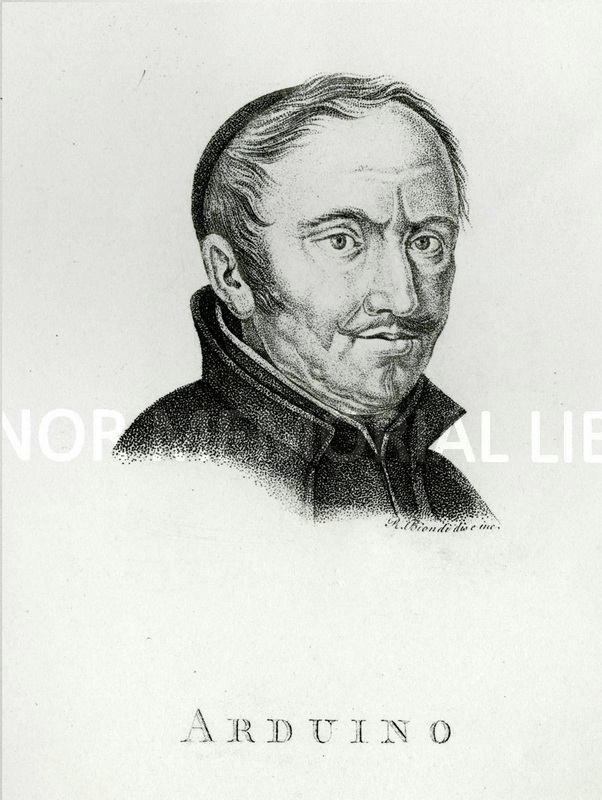 Another Jesuit, Father Buffier was one of the first Frenchmen to adopt the empirical philosophy of Locke. A coincidence of views is particularly apparent with regard to the philosophy of Malebranche, which became very influential in Paris in the 1700s and even gained adherents among the Jesuits themselves. The Journal de Trévoux readily echoed Hardouin's hostile verdict, condemning Malebranche's notions of "vision in God" and God as "indeterminate being" as an erroneous identification of the deity with the totality of the universe. According to Professor Kors, Hardouin manuscript lectures and expositions of Malebranche's position "termed it atheism pure and simple and, analyzing what "followed" from its premises, gave virtual lessons on how to think atheistically...When the new philosophy says God always understand "the reality of things" or "their truth" or "Nature" or the "Necessity of the laws of motion". For Malebranche "there is no other God but "Nature", "the reality of things" or "the Necessity of the laws of motion"". Hardouin's conclusion is simple, but devastating: a book in which atheism is established and the idea of God overturned, cannot be the work of a saint which the church has canonised. It was of course Hardouin's peculiar misfortune to have formulated so inclusive a definition of atheism and so embracing a theory of forgery and then to have adhered to it in the face of all common-sense probability. Nonetheless, Huet could perhaps still rightly say that "Father Hardouin worked for forty years to ruin his reputation, without being able to achieve his goal". "L'Harduinisme" in Simon-Augustin Irailh, Querelles littéraires, vol.III(1761) p.19-40. Alan Charles Kors, Atheism in France 1650-1729 (1990) p.343-4;366-9. C.M. Northeast, The Parisian Jesuits and the Enlightenment SVEC (1991) p.81-88;116-9.